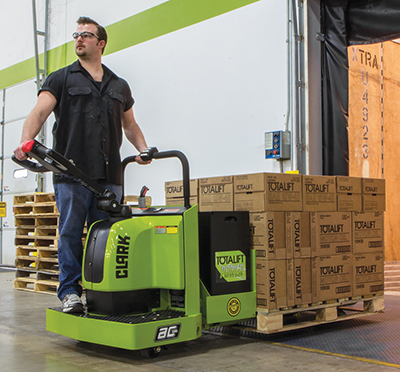 Clark’s riding pallet truck comes with a small yet powerful 24 Volt battery and 100% AC system that can manage a lift capacity of 6,000-8,000 lbs. This pallet truck is most suitable in warehousing and manufacturing applications, but it’s optimal for food processing plants because of its enclosed AC motor. The riding platform is spacious with its ergonomic design and safe for the operator. The integral pump, motor and reservoir assembly doesn’t require a breather cap, eliminating a potential leak site and a place where dirt can contaminate the system. The spiral bevel gears are immersed in an oil bath and sealed in a heavy-duty case. There’s no master cylinder, no seals and no hydraulic fluids so there aren’t any leaks. The parking brake is automatically applied when the truck is stopped and the handle is released for added safety. Fully enclosed to keep contaminants out and makes wet environments a nonissue. There are no brushes to change or commutator to turn. There’s no need to pull the motor to turn and undercut the commutator, so there’s a less likely chance of burning out the motor during a stall. Advanced thermal protection prevents heat damage to the motor and control. Operator control handles are available with either a twist grip or thumb operated control. The toggle switch allows the operator to choose low or high speed range based on the application. There’s ample foot room on the riding platform with a top mounted handle. The heavy duty, welded and formed steel plate protects from impact damage and extends the life of the truck. Pull rods are adjustable to maintain proper fork height over the life of the unit, and they’re constructed from steel bar stock for maximum strength and durability. Bronze bushings are extreme-duty and are used at lift linkage pivot points. Spring-loaded stability casters maintain contact on uneven surfaces to insure a smooth ride. Elevation brackets have a three-lug design that reduces binding and promotes longer pin and bushing life. All pivot points are greaseable and feature steel-backed bushings. These warehouse products are available for sale or lease. Contact a Forklifts of Toledo Sales Representative for pricing and additional information.